Referencing has long been considered an essential practice in academia, but the increasing availability of information in today’s digital age has fundamentally changed the way some students perceive ‘giving credit where credit is due’. It is therefore crucial that students are well-informed on how and when to reference so that they can avoid being marked down or face disciplinary action for plagiarism. In February 2016 we conducted two online surveys among 4,979 students currently enrolled in higher education. The surveys were conducted by OnePoll and SurveyMonkey and the findings have been analysed and interpreted by Cite This For Me. Two groups were surveyed, students who currently use Cite This For Me and those that do not, and the two sets of findings have been amalgamated at times where statistically relevant. The survey found that 65% of the students surveyed are concerned about accurately referencing their work. Whilst referencing should not be considered a chore, every student should bear accurate referencing in mind when they carry out academic research. Fortunately, using an automated citation tool will help students to reference correctly and avoid the risk of plagiarism, potentially eliminating any concerns they may have. In 2015, a survey conducted by Student Engagement Insights found that 25% of students said their peers are very concerned when it comes to plagiarism, and 45% of students indicated that their peers demonstrate at least some concern about plagiarism. The real cause for worry is the 6% of students who admit their peers are “not at all concerned” about plagiarism, and the 5% who only care about it to the extent that they don’t get caught.1. The results demonstrate the value of using a referencing management tool by highlighting that those who do not use Cite This For Me are more susceptible to referencing incorrectly than those who do. In comparison with 48% of Cite This For Me users, 10% more of non-Cite This For Me users have been marked down on their work for inaccurate references. It is important to note that Cite This For Me users were asked if they had ever lost marks, and were not asked to differentiate between before and after they started using Cite This For Me. Cite This For Me enables students to generate accurate and intuitive references, fully-formatted in 1,000+ styles – including popular styles such as MLA format, Harvard referencing, and APA referencing. Students can reference like a pro with Cite This For Me’s multi-platform tool. Create references in a flash with a smartphone camera by using the highly-rated iOS and Android apps, or Cite This For Me for Chrome – the browser extension that allows instant creation and edit of a reference for any online source. It is widely known that there is a lack of understanding around the rudimentary requirements for crediting sources in written academic work. A 2015 study confirmed this when it found that students who are new to university lacked even a basic understanding of how to cite sources. Interestingly, those same students claimed that they were very confident they understood what both referencing and plagiarism are. 3. The results show that the majority of both groups surveyed fear facing disciplinary action for plagiarism. Fortunately, this widespread concern can be easily avoided by simply learning to reference correctly. Using an accurate referencing tool helps to reduce this fear by giving students the confidence that they will not lose points for their bibliographies. Rather than wasting precious energy worrying about the penalties for plagiarism, it is important that students use their time wisely to develop essential academic skills. Studying at university level teaches students to: formulate their own thoughts and responses on the topic, to paraphrase and summarise whenever possible, and to acknowledge their sources by taking the time to accurately credit them. Of all the students surveyed, only 45% agreed when asked if they felt they had received enough information about referencing during their studies. Referencing is a complicated process that takes time and dedication to master, so it is a real cause for concern that 23% of students revealed that they had not been provided with enough information on how to reference accurately. CTL Consultant Katie Malcolm suggests that plagiarism is often the result of students receiving insufficient information on referencing, rather than an act of laziness: “Even students who have copied entire pages from online sources have revealed to me that their reasons for doing so are governed not by indolence, but misunderstanding my expectations for sources, for citations, and/or for their own abilities and growth – imperfect as these may be.” 5. These findings expose a cry for help from students, and indicate that the lack of information available to them is the source of much of the confusion surrounding the referencing process. 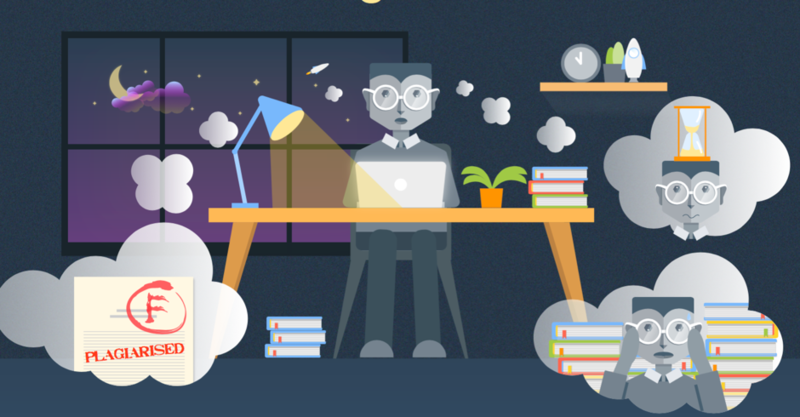 Whilst students have a range of ideas about what might be in store for them if they are caught plagiarising, most students acknowledged the gravity of plagiarism offences. For instance, 79% are correct in thinking that plagiarism can result in suspension or expulsion from their university, and 73% are aware that their work can be marked down. The consequences of student plagiarism can be extremely serious. In most cases, it will result in a failing grade for the assignment or possibly failure of the course. In extreme cases, such as repeat offending, students can face the loss of academic scholarships or outright expulsion. If their work is published, they may face legal action from the original author. 6. Whilst the majority of students identified paying someone else to write your essay for you as a form of plagiarism, surprisingly 20% were unable to identify that this constitutes academic misconduct. 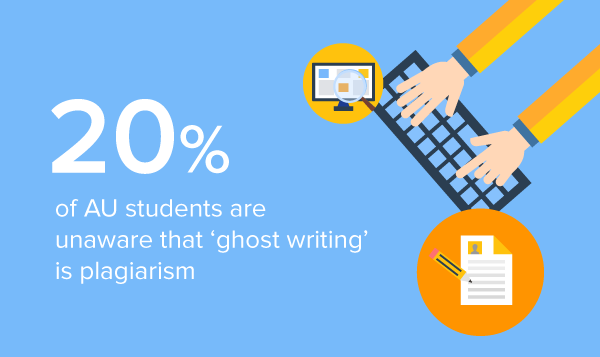 It is worth noting that 7% of those students did not know that ‘ghost writing’ is considered a serious form of plagiarism. Although 80% of students are aware that outsourcing ghostwriters is a major issue, universities across Australia are experiencing the negative effects of the fast-growing and lucrative ghostwriting industry. Zero-tolerance policies and vigilant detection methods have been adopted by universities to minimise the number of students cheating. However, it is apparent that installing a plagiarism detection system, such as Turnitin, is no longer enough to prevent students from cheating. Thirteen students were recently expelled from Deakin University for commissioning a ghost writing service. This form of plagiarism is also known as ‘contract cheating’; students risk losing their place at university and international students could have their visa revoked if they are caught paying for these services. 7. A further 36 students were caught in a cheating scandal at Macquarie University; two had their degrees revoked and ten were prevented from graduating after the university found they had used a ghostwriting service to complete their coursework. 8. The Australian National University launched an investigation into an ‘essay factory’ selling made-to-order assignments to Chinese students in Canberra. This has become popular practice amongst students for whom English is a second language. International students are often under a lot of pressure to succeed and usually have had to make a financial sacrifice to study in Australia. The temptation to cheat is made all the greater by the cost of education and a lack of available support – particularly with regards to improving their English skills. A ghost writing service can charge more than $1000 as a flat rate for a pass or a credit, and even more for a distinction quality assignment. 9. It is vital that students use their education to prepare themselves for working life rather than just cheating their way through university. Those who cheat risk leaving without the necessary research and writing skills to progress in both their academic and professional careers. The results exposed a degree of uncertainty around recommended referencing practices, with 49% of students either unsure or unaware that they do not need to reference common knowledge and everyday phrases in their assignments. Reassuringly, 51% of students surveyed were able to identify that they are not required to reference common knowledge in their work. Common knowledge is information that the average person would typically accept as a reliable, proven fact. For instance, most people know that ‘Barack Obama is the first American of mixed race to be elected president’ so it is unnecessary to credit it in your work. 10. Likewise, when you use phrases that have become part of everyday speech, such as “all the world’s a stage” or “life, liberty, and the pursuit of happiness”, you do not need to reference them or even to put them in quotation marks. 11. However, if in doubt about whether something is considered common knowledge or an everyday phrase, students should err on the side of caution and add a citation (whether that be in APA format, MLA format, or another style. In order to avoid committing plagiarism, students must accurately reference all source material used in their written work. Although a small portion of students were unaware, this study found that 88% of students understand the importance of referencing information copied from a publically available website. Today’s digital age has blurred the lines of ownership and intellectual property theft in academia. It has become increasingly easy to access information and knowledge via the internet, which in turn has negatively impacted the research journeys of some students. 12. The discovery that 12% of students were either unsure or believed that it is unnecessary to reference online sources underlines the importance of educating students in core values such as academic integrity. Accurately and honestly referencing your work is key in preserving your academic integrity throughout your studies. Students must reference all thoughts, ideas and theories that have contributed to their work, along with statistics, online information and designs or works of art. Dishonest actions such as cheating in an exam or copying material from the internet will result in your work being severely penalised for plagiarism. This can involve charges of academic misconduct, cancellation of results, or even exclusion from a course. 13. It is highly recommended that students ensure that they have a thorough understanding of how to reference their sources, record all bibliographic information whenever they find a relevant source, and if in doubt seek further advice from their institution’s learning skills service. Using technology to automate references allows students to keep their work free from plagiarism, leaving them more time to spend on broadening their research and strengthening their writing. Nevertheless, this does not remove the need to educate students in understanding why citing is important and how a citation is created. Given that 74% of students reported that they use a referencing tool, and 46% say they use plagiarism checker tools before submitting their work, it is clear that students are actively seeking helpful solutions to reduce the risk of plagiarism. Tami Strang, “Are College Students Concerned about Plagiarism?,” Learning Outcomes, September 7, 2015, http://blog.cengage.com/are-college-students-concerned-about-plagiarism/. John English and Chris Ireland, Plagiarism: Let’s Start as We Don’t Mean to Go on, (n.p., 2015), http://eprints.hud.ac.uk/10515/1/IrelandPlagiarismpdf.pdf. Philip Newton, “Academic Integrity: A Quantitative Study of Confidence and Understanding in Students at the Start of Their Higher Education,” Assessment & Evaluation in Higher Education, March 27, 2015, doi:10.1080/02602938.2015.1024199. Katie Malcolm, “Plagiarism and Inclusive Teaching: A Perfect Union?,” January 20, 2015, http://www.washington.edu/teaching/2015/01/20/plagiarism/. “Consequences of Plagiarism in College | the Classroom,” 2001, accessed May 3, 2016, http://classroom.synonym.com/consequences-plagiarism-college-1338.html. Timna Jacks, “Deakin University Students Kicked out for ‘contract cheating,’” The Age, May 18, 2016, http://www.theage.com.au/victoria/deakin-university-students-kicked-out-for-contract-cheating-20160517-goxm1y.html. “Macquarie University Finds 36 Students Cheated Online and Revokes Two Degrees,” The Guardian, May 28, 2015, http://www.theguardian.com/australia-news/2015/may/28/macquarie-university-finds-36-students-cheated-online-and-revokes-two-degrees. “Thinking of Cheating? Think Again,” 2016, https://www.idp.com/australia/studyabroad/blog/thinkingofcheatingthinkagain. “What Is Common Knowledge,” accessed May 5, 2016, https://integrity.mit.edu/handbook/citing-your-sources/what-common-knowledge. “6.4 Plagiarism,” accessed May 5, 2016, http://www.webpages.uidaho.edu/info_literacy/modules/module6/6_4.htm. Kuwcnews, “Exploring and Preventing Plagiarism in a Digital Age,” September 23, 2015, https://kuwcnews.wordpress.com/2015/09/23/exploring-and-preventing-plagiarism-in-a-digital-age/. “Academic Integrity – RMIT University,” 2016, accessed June 2, 2016, http://www1.rmit.edu.au/students/academic-integrity.